Enter the Daemon Dojo! It's typical turn-based RPG combat, but without turns; select attacks super-effective to your opponent's current martial stance, which also determines what they'll attack you with! When they prepare to attack, use a super-effective dodge to negate damage! But there's a twist: this is all done in breakneck real-time! Illustrated with beautiful hand-drawn sprites and charming enemy designs. 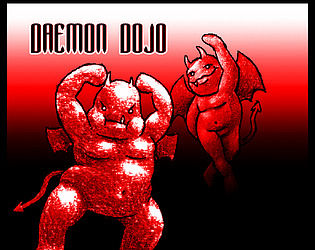 How far can you go in the Daemon Dojo? The whole game is controlled with the mouse, but you can press space at any time to go back to the start of the combat menu. To defeat an enemy you just have to select the "Fight" option, and choose the martial stance that is super effective against the enemies, the button will be covered in spikes if it is effective. When an enemy is about to attack, a white X will appear below it, when this happens, go to dodge and select the martial stance that is effective against the enemies stance. Once the enemy attacks, it will deal 30% of it's damage instantly, and the other 70% over the next 3 seconds, so dodging late is still better than not dodging at all.